The author and columnist tells a party guest about the “self-reflexive mythos” inherent in Dio’s band dynamic. 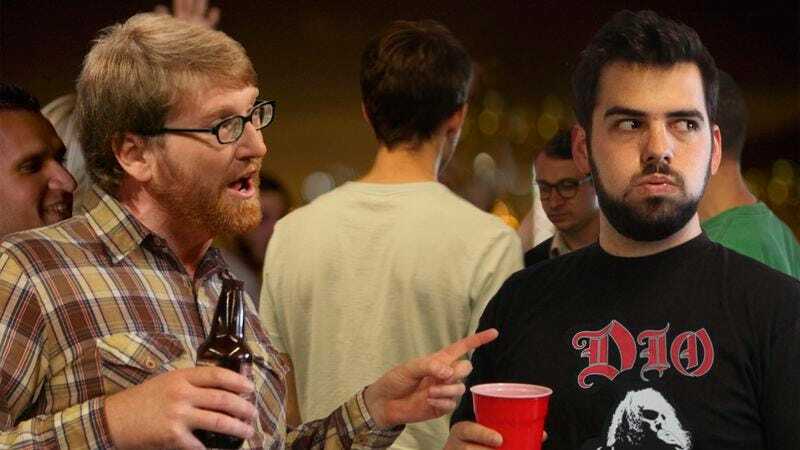 NEW YORK—Author Chuck Klosterman reportedly cornered a guy who was wearing a Dio shirt at a party Thursday evening and dominated an exhaustive discussion on the metal band, addressing the group’s fantasy themes, deconstructing lyrics, and expounding a variety of related and semi-related topics. “And yet, with its expert power riffs and and its sense, lyrically, of overcoming Stygian forces, it also completely rocks, and thus sort of fulfills its raison d'être,” added the 42-year-old author. Klosterman, who reportedly never introduced himself or asked for the man’s name, reflected on the “winking aggression” of Ronnie James Dio’s lyrics, which he acknowledged were emblematic of an escapist realm that reflected the needs and desires of a largely working-class fan base. Though the man reportedly thought the conversation had concluded after 45 minutes, Klosterman moved closer, blocked him from leaving with his body, and started to talk at length about Dio’s bassists Jimmy Bain, Teddy Cook, Jeff Pilson, Larry Dennison, and Rudy Sarzo, and how the band’s shifting lineup “only further emphasized what remained constant” about the group. The man, who did not speak one word during the entire exchange, reportedly purchased the Dio shirt at a thrift shop. Sources confirmed that Klosterman continued to invade the personal space of the man who tried to look away but was unable to escape the columnist’s ceaseless monologue, which swiftly hit on subjects such as the symbolic elements of Dio’s stage show, the significance, and “narrative continuity,” of recruiting former members of the groups Black Sabbath, Rainbow, and Sweet Savage, an obscure Canadian teen television drama, a road trip he took in the summer of 1995, and the inherent comic dualism of the Dio logo, which is Italian for “God” and spells out the word “devil” when viewed upside down. Eyewitnesses told reporters that the man promptly fled the party, pushing several guests out of his way while frantically attempting to exit the apartment.